The Pause Is Real – Get Over It! Whenever the pause in global warming is discussed, alarmists usually try to deflect attention by claiming it is the result of cherry picking the big El Nino year of 1998 as the starting point. Step forward Mark Shapiro, who has either fallen for this propaganda trick, or is busy propagating it. Although 1998 remains the warmest year on the satellite record, it has little effect on the trend since then, because it was followed by an equally cold, double La Nina in 1999/2000. The UK Met Office were totally clear on this, in their report, “The recent pause in global warming: What are the potential causes”, published in 2013. There is actually a cooling trend. 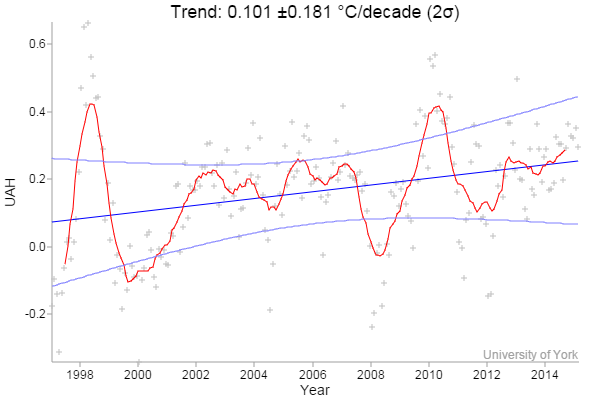 There were ENSO neutral conditions throughout 2001, which makes it a good place to start any comparisons. In contrast, last year had moderate El Nino conditions, which makes the declining trend even more remarkable. Whether the pause began in 1997 or 2001, the fact remains that it is real, and not some statistical artifact. The logic of going back to 1997, is that this is the furthest you can go back to without finding a warming trend. Mark Shapiro suggests that we should ignore the last 18 years with no increase in temperature, and instead focus on the rise since 1979. But nobody disputes the fact that temperatures rose from the late 1970’s to 1998, which was in large part due to the switch to the warm phase of the PDO, combined with the recovery of the AMO. What clearly matters now though is the current pause, and what it tells us about temperature trends in the next few decades, particularly given the fact that the AMO has not begun to decline yet. ← Golly Ghosh! What Has She Been Smoking? The number of adverse commenters & organisations you shoot down in flames could itself contribute towards Global Warming. If we look at RSS data c.1988 to present , 27 years, we see what? Statistically meaningless increase. A man was born in 1979. By 1997 he was 6 feet tall. Since 1997 he has remained 6 feet tall. However based upon his growth trend I can expect him to soar to 8 feet tall shortly. I recommend downloading single site data from around 1950 to the present, for several sites. You don’t have to worry about GISS’ manipulations. Their arrogant and ignorant adjustments are of little consequence in the following operations. Run a simple regression – to estimate the “trend” . It will almost certainly be a significant positive value. If you know how to assess statistical significance or, equivalently its probability, just do that. Remember that r-squared by itself tells you virtually nothing of value. It is its significance, or that of the regression coefficient that matters. Also, generate the fitted values for the regression. Now, divide the data set into two segments, the first up to and including 1987, the second from there to the present. Now carry out the the above simple regression operations for both subsets. Compare the equations with the single full period regression, and compare the fitted values at 1987 and 1988. Now think about where the “pause” started. You are quite likely to find that before 1988 the regression slope was perhaps “significant” and positive. From 1988 onward the slope is likely to be indistinguishable from zero. In other words, after a longish stable period a step occurred at 1987, and since then there’s been no warming (or very little indeed). Is this cherry picking? Yes, of course, but it is very well founded. It is easy to demonstrate that for these regions there was a step change. More detailed analyses, using data that removes the annual cycle, show that this change usually occurred within a month or two of September 1987. The “significant” full period regression is simply the result of of a step change at 1987. It does NOT represent a gradual increase, something fundamental to the CO2 disaster theory. Climate tends to proceed via stable periods punctuated by step-like changes. I propose that it is currently impossible to forecast single site temperatures due to the apparently random occurrence of steps. My belief is that “The Pause” in northern Europe and Russia began in 1987 or 1988. My guess for Europe is September 1987 and for eastern Russian sites up to a year later. that’s when the PDO will rise, so not much should change. We don’t know what the PDO will do, it’s based on the prevalence of El Ninos and La Ninas over decades. If we get a repeat of the 60’s and 70′, there’ll be more talk of ice ages again. 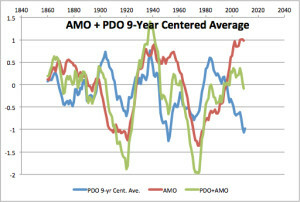 Both PDO and AMO will be cold during the 2020’s and 30’s. If CO2 is the cause there should be no pause. I prefer to think of coal usage as returning carbon back into the shorter term carbon cycle from where it got accidentally sequestered. Neither of them show a clear long-term trend, either up or down. The 1998 El Nino caused a step of approximately 0.3ºC. Without that step.. there has been NO WARMING AT ALL in the RSS data. The Slight warming before is cancelled by the slight cooling after. Without the El Nino, UAH shows a very gentle trend of about 0.07ºC/decade. The ONLY way any remotely interesting trend can be shown in either satellite record is to include the non-anthropogenic El Nino step. Paul, there two metrics. 1. Zero (or negative) trend. Monckton at WUWT. 2. Zero statistically significant rising trend. McKittrick et. al 2014. For obvious reasons, the second metric is more robust. That avoids Dessler’s 2010 abomination finding positive cloud feedback, but with an r^2 of 0.02! But with either metric, the correct procedure is to work back from the whatever present. The present is NEVER a cherrypick. It is merely the point at which we have the most information to analyze.. Depending on temperature data set, either method now mostly falsifies GCMs using either the NASA 2009 (15 year) or Santer 2011 (17 years) criteria previously published. Marotzke’s recent revisionist effort to push beyond 18 years was shot down in mathematical flames by Nic Lewis at CA last month. The best answer to Shapiro is he has got it backwards and is grasping the wrong end. Works for baseball, cricket, and hockey analogies to the correct statistical methods. And would people please stop using the words “pause” and “hiatus”. Both have implications that the slight warming trend might someday continue. We don’t know that. Many real scientists are looking at cooling being more probable. “Plateau” is a more appropriate word. AG55, you may be right, but that train left the station long ago. ‘Pause’ is the common/MSM discourse. Hiatus is IPCC AR5. Both ‘presume’ an eventual continued increase. That could happen, or it might not. Both terms suffice to falsify the IPCC CMIP5 models predicting doom. I prefer imprecise but popular/IPCC terminology that still wrecks CAGW conclusions. Verbal judo. Win the battles you can, not the ones you wished had been fought. IMO. Note that Global Warming is about increases in the net thermal energy stored in the Earth’s biosphere. Your discussion above addresses only the thermal energy stored in the atmosphere as measured by its temperature. The gasses that make up the atmosphere constitute only a very tiny fraction of the thermal energy storage of the biosphere. A. J. Miller, Et al. The 1979 starting point is a bigger cherry pick than the 1998 starting point. 1979 represents the end of a long cooling trend that started around 1940. Much of the warming from 1979 to 1998 is merely a return to pre-1950 normals. Apart from showing the obvious self-delusional aspect of climate modelling that the IPCC and many world opinion leaders rely on, this discussion seems to me to show that climate is even less clear a term than I had previously thought. Over what timescale does weather variability become climate change; there are clearly a number of cycles going on but should climate change be defined in terms of decades, centuries or millennia: it clearly cannot be in years as the noise is so much larger than the measured values. The variability makes the economics of investing massively with the aim of “avoiding climate change” even more foolish than they appeared to be. I loved the ideas that coal is wood that has not yet been burned and that a 6′ person is in a growth pause. Surely Paul you should be using the scientifically validated method of homogenization. That is to say (or correctly presume) 2010 and the late 1990s peaks are outliers, and this original data must be erased and infilled with suitably averaged data from the periods before and after these events. Please ensure that no reason or validated methodology is given for exactly how this was done as the ‘authority of science’ is all that is required for it to be used. Interesting thing is the different trends, except for the entire data sets, and that UAH has similar trends for all different time periods. 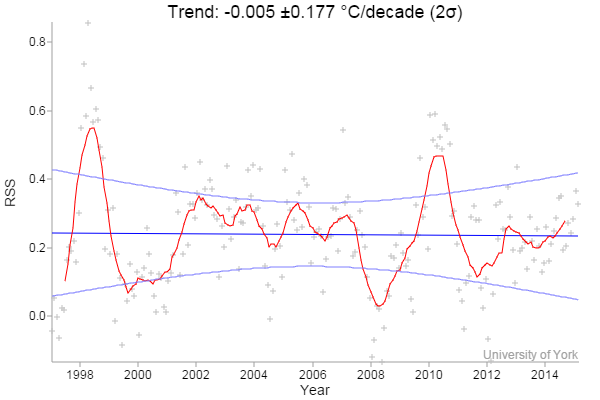 If you use linear trends, they certainly shouldn’t be taken across the 1998 El Nino step. If you split to before and after the El Nino on the two satellite data sets, you can see why RSS is -ve vs UAH +ve for the last 15 years. They are actually coming closer together after different starting points and pre El Nino trends. Linear trends over a major step event… tells you nothing.. is meaningless. Statistically, my understanding is that neither the RSS fall nor the UAH rise would be regarded as statistically significant. Also if you take UAH back to 2001 (rather than the big La Nina of 2000), the rising trend prior to 2000 virtually disappears. Paul, if you look around 1996, you can see where the El Nino started to effect the normal up and down of the pre-El Nino pattern. This is where the pre-El Nino trend should finish. In the PDF, it’s on p. 194 in Chapter 2 of WG1. Warmists propaganda (and declining weight) shall not restrain our thinkings…! A little time ago Dr ~Jones at UEA suggested that (he and the other warmists) “needn’t” start worrying until a lack of temperature rise had manifested itself for 15 years. It was not explained why IPCC, DECC, Met Office, BBC, or any of the others should “worry” if the temperature did not rise, rather than be jubilant. However, be that as it may – has anyone heard at all of his current level of concern ? Since his and their concerns are our imminent demise, are they now less worried, or more worried I wonder?